Friday marked the two-year anniversary of the disastrous BP oil spill. Triggered by the explosion on the Deepwater Horizon drilling rig on April 20, 2010, the tragedy took the lives of 11 people and continues to threaten the animals and ecology of the Gulf of Mexico. Two years later, TNR takes a look at some of the animals that continue to be affected by the spill, which spewed about 4.9 million barrels of oil into the water. In the two years since the BP spill, over 600 dolphins have been found washed up on Louisiana beaches: 95 percent are already deceased. These numbers are eight times the pre-disaster average. A report by the National Oceanic and Atmospheric Administration has found that the affected dolphins have liver problems and deflated hormone levels, which may be the result of exposure to chemicals released from the spill. The spill’s fatal affect on turtles has not yet abated: Just in the last week, more than 20 dead turtles have washed up on Mississippi beaches, according to marine mammal expert Moby Solangi. In the weeks following the oil spill, fishermen who had returned to the waters reported finding fish with large open sores and other irregularities. Today, fishermen are still finding grouper and red snapper with similar defects. A study conducted last summer concluded that nearly 3 percent of the fish in the gulf coast still had symptoms of environmental contamination. 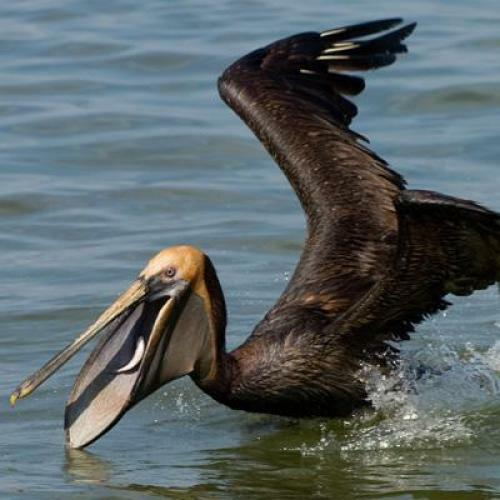 Brown Pelicans of the Gulf Coast haven’t been physically damaged by the spill, but their rookeries and nesting places are still severely affected. An AP photographer recounted his experiences of photographing pelicans “too coated to fly” back in 2010 and seeing the erosion and deterioration of their habitat on a recent return trip. The birds may have more to worry about than just their homes: Studies are looking into the effects the oil spill had on the pelicans’ food supply. Scientists studying the Gulf Coast oysters in the two years since the BP oil spill have found that oysters still contain higher concentrations of heavy metals in their shells, gills and muscle tissue than they did before the spill. This resonates far up the food chain, as the harmful toxins are passed on to the many organisms that feed on the Gulf oysters. A recent report by Al Jazeera found that a massive presence of mutated shrimp have begun to be found in the Gulf of Mexico. The shrimp are being born without eyes, or with tumors and lesions on their heads, something unheard of before the spill. A National Oceanic and Atmospheric Administration study found that the oil spill would “likely result in less than a 4 percent reduction of future spawning biomass” of bluefin tuna in the Gulf. According to the Wall Street Journal, the analysis was based on the assumption that up to 20 percent of baby tuna were killed or left unable to reproduce because of the spill. Nick Robins-Early, Perry Stein, and Eric Wen are interns at The New Republic.